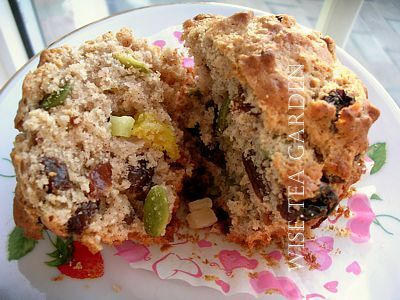 SUPER MUFFIN with Raisins, Pumpkin Seeds, Cardamom, Cinnamon, Natural Dried Apple + Pineapple + Banana Pieces, and Natural Dried Papaya Cubes - a delicious extra to your afternoon tea. Recipe and photography © WISE TEA GARDEN® Organic Bakery » Tea dressings not only enhance the profiles of your favourite teas, but fresh or dried herbs and bark are also traditionally used for making homemade cosmetics and soaps, medicinal remedies, essential oils and steam-room herbal essences, they are widely used in cooking, dyeing wool, and for other purposes. All tea blending components we sell are originated from reputable and ethical sources widely recognized as one of the world's safest and highly experienced manufacturers of dried herbs and fruits. All tea products sold in our Tea House are meet EU/Canada/USA/Japan specifications for agricultural inputs. Organic and food safety certifications: Canadian Organic, EU Organic, USDA, Avendra, HACCP, Fair Trade. A certificate of origin and profile are supplied with each tea or tea spice. At out Tea House, Tea Dressings are sold in nitrogen-flushed and vacuum sealed packs of various weights only to maintain an ultra freshness. But please request a sample (6-10g per sample pack). Note: If you are buying herbs and fruits for your business, or your order is over $350, please request a volume purchase discount ». North American orders over $250 are free of shipping charges. A partial postage must be paid for international shipments. Shelf life of nitrogen-flushed and vacuum sealed packs: from 6 to 12 years depending on variety. Place 2 table spoons of elderberries and 500ml of filtered/distilled water in a small saucepan. Add 1/4 teaspoon organic turmeric and 1/2 teaspoon organic cinnamon. When start to boil, reduce heat and simmer for 15 min. Remove from stove and let stand for 5 more min. Strain and pour into mugs. Add honey to taste if necessary. Ingredients: 1 part Dried Organic Lemongrass, 1/2 part Dried Jasmine Buds. Thoroughly blend all ingredients in a drum or large bowl and place in jars or tins. *Adjust ingredients for larger quantities. 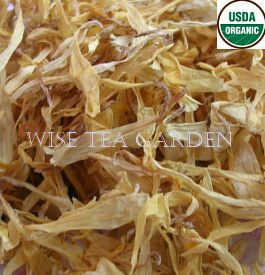 An exotically sweet herbal infusion can be made by brewing Dried Jasmine Buds in the same way you would a cup of regular tea. The cup calms the mind and cools the body. Use roughly 1 level tablespoon per cup, infuse for 3-5 minutes, strain and enjoy. Also makes a delicious iced tea - simply strain hot tea over a tall glass of ice. Packaging: Nitrogen-flushed vacuum-sealed packs of various weights. 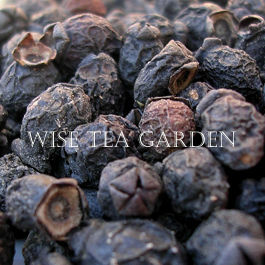  Tea Spices are sold in nitrogen-flushed vacuum-sealed packs of various weights only. Shelf life: 6-12 years depending on variety. Cup Characteristics: Great and ideal for making Apple Punch! Delicate apple notes with a sweet Macintosh finish. Apples are acknowledged to contain many vitamins and are part of a healthy lifestyle. 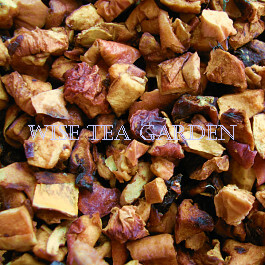 Dried Apple pieces add an interesting visual element to any tea blend. 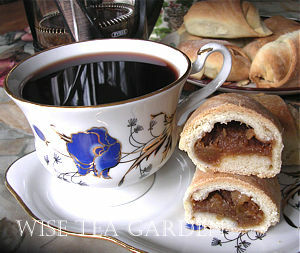 Turkey's famed apple tea is served literally everywhere throughout the country. Whether you're seated in a bus station, public park, carpet shop or the courtyard of the Blue Mosque, apple tea served by roaming merchants will be readily available. The tea also plays a key role in Turkish business transactions. Ingredients: Luxury Natural Dried Apple pieces. Infusion: Pale yellow. Cup Characteristics: Clean notes of tart and mildly acidic Apricot are reminiscent of summer! 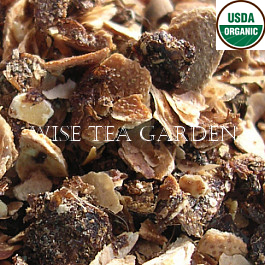 Expand the taste of your tea with this delicious and sweet ingredient. For example, Hunza Blend Iced Tea: Infuse a handful of freeze dried apricot along with a medium bodied pot of Ceylon or Lover's Leap black tea. Pour over ice, garnish with lemon, sweeten to taste and serve. Ingredients: Apricot pieces. Cup Characteristics: Neutral, slightly zesty character, with a hint of fruit at the finish. Bilberry is a member of the same plant family as blueberries and cranberries. To mention: France and Turkey are known for growing the finest herbs on the planet. There is a believe that bilberries could help lower cholesterol, reduce inflammation and aid in digestion. How to brew Bilberry Tea: infuse and steep 1 tablespoon of bilberries in a cup of boiling water about 10-12 min. Strain, add honey to taste. Infusion: Clear with hints of purple. Ingredients: Air Dried Bilberries. 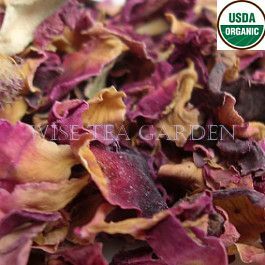 Organic Certificates: Certified Organic by QMI Organic Inc.
Cup Characteristics: Colorful petals with a mild vegetative note. FYI: The name dates from Roman times when calendula flowered on the first of the month - the calends. 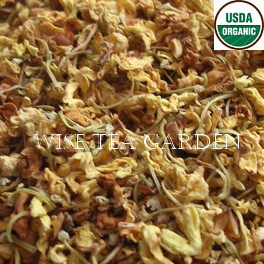 Ingredients: Organic Calendula petals. Infusion: Noon hour bright. Cup Characteristics: Field grown, sun dried, grown in accordance with European organic standards. Very aromatic with a fruity soothing floral bouquet, this pure herbal tea produces a cup that is at once lively and relaxing. Ingredients: Organic Egyptian camomile. Infusion: Tending light and yellowish with honey notes. Cup Characteristics: Very floral with pungent notes and long lingering finish. 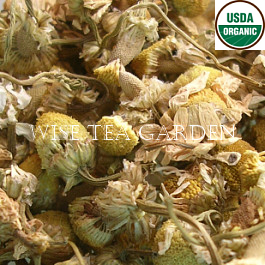 Chrysanthemum is extensively used in Chinese herbal medicine to clear fever and headaches associated with colds and flu, to ease tension and headaches. 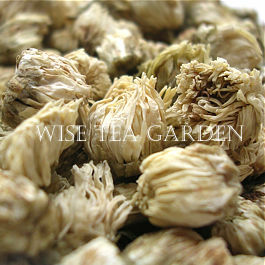 Ingredients: Chrysanthemum flowers. Infusion: Tending clear to light yellow. Cup Characteristics: Tart and sweet at the same time. Very pleasant flavor noting of Egyptian origins. Ingredients: Hibiscus. Infusion: Brilliant ruby red. Cup Characteristics: Delicate notes of cherry peek out from fragrant jasmine. Clean fruity floral finish. FYI: Chinese chronicles notes a jasmine infusion calms the nerves. 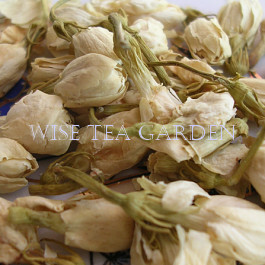 Ingredients: Natural dried jasmine buds. Infusion: Light yellow. Cup Characteristics: Traditional and sundried. A lovely deep red infusion similar to pomegranate but with a "pucker power" taste similar to lemonade. 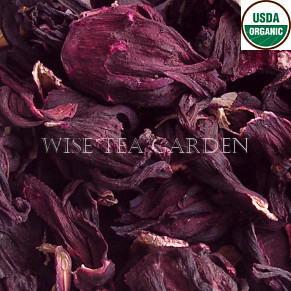 Hibiscus is tangy and full of natural Vitamin C. As a stand-alone tea, the taste is sweet, honey-ish and incredibly fresh. Blended in with other herbals, green or black teas, hibiscus imparts an added layer of tart astringency and floral character. Ingredients: Luxury organic hibiscus. Infusion: Bright burgundy red. Cup Characteristics: Mild with a distinctive floral perfume and slight pungency. 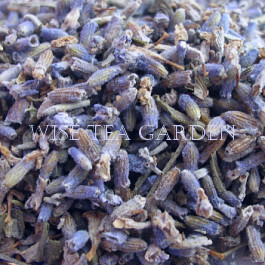 Lavender is an excellent plant for infusions and has an agreeable floral flavor. 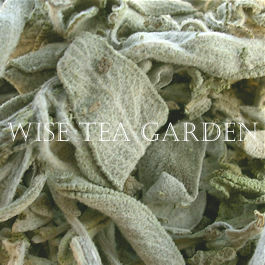 Since Lavender has quite an aroma and flavor profile it is often used to give a tea a special signature. Lavender mixed with Earl Grey gives a very interesting "twist". Luxury Ingredients: Luxury lavender blossoms. Infusion: Tending mauve to purple depending upon the amount used. Cup Characteristics: Field grown in Thailand, with a sweet lemony scent and ginger undertones. Often used in teas to impart a lemon character without the tangy flavor. Tea made from the plant is thought to calm the nerves, and restore the spirit. 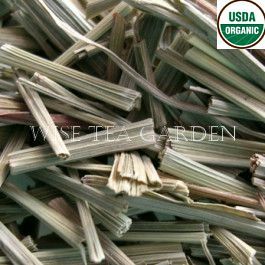 Ingredients: Luxury natural dried lemongrass. Infusion: Bright, pale infusion. Cup Characteristics: Natural, Sun + Machine dried Lemon Peel. Grown in the Egyptian Nile Delta, very aromatic with a fruity tending floral flavor. Use it to create any organic lemon refreshments. 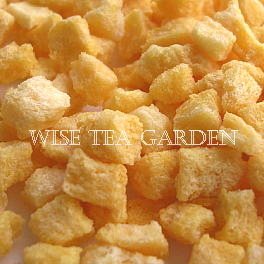 Ingredients: Luxury organic natural dried lemon peel. Infusion: Pale yellow. Cup Characteristics: Field grown, sun dried, machine milled (coarse cut). Sweet character with light medicinal notes and anise-like finish. 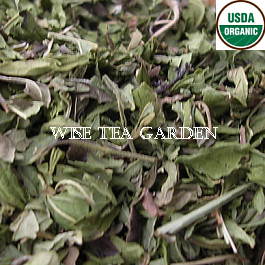 Excellent blended with Peppermint or Camomile. 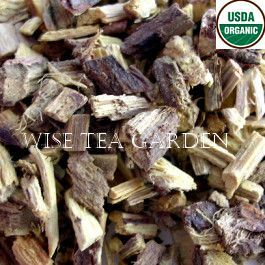 For a unique twist, try blending Licorice Root with other herbal, black, or green teas. Ingredients: Premium licorice root. Infusion: Tending yellow green. Cup Characteristics: Deliciously musky with sweet and strong citrus notes. Dried Lime Leaf makes an excellent component in custom loose tea and herbal blends, adding a layer of leafy citrus to the cup and an exotic visual component. According to the Thai people, the benefits of consuming lime leaves extend beyond their flavoring abilities. 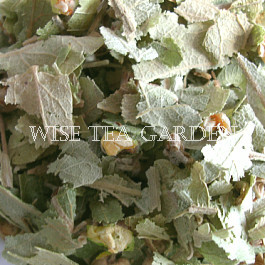 They believe that natural properties in the leaves make them an excellent digestive aid, have the ability to cleanse the mind, erase negativity and ward off evil spirits. Try for yourself and watch the evil spirits float away in the tea steam! 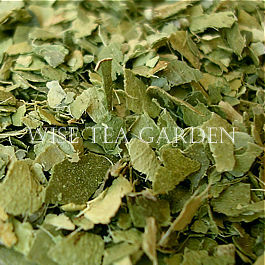 Ingredients: Luxury natural dried lime leaves. Infusion: Tending yellow green. Cup Characteristics: Sweet and lightly spicy. 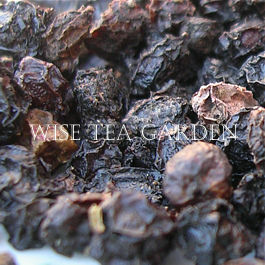 It is naturally dried using an age-old sun drying technique, exhibits the perfect balance of sweet and heat, and can be used to create your own tea and herbal blends, or as a natural additive to brewed tea for a sweetly scented treat. 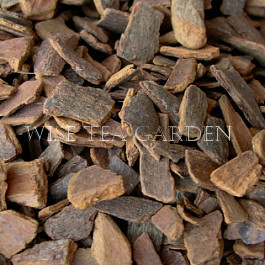 Ingredients: Luxury natural dried cinnamon bark pieces. Infusion: Tending light ochre. Cup Characteristics: Slightly tart with gentle citric notes and mild taste, very mild character verging on flavor neutral. Orange peel is rich in Vitamin C and is used in tea blends for citrus notes. 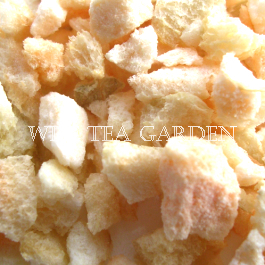 Luxury Ingredients: Luxury natural dried orange peel. Infusion: Very pale yellow. * US Customers: Sweet Orange Peel is banned for importation to US. Please order locally. Cup Characteristics: Wild grown Osmanthus flowers. Delicate and light peach-like flavor notes. A pinch of Osmanthus in a tea gives a springtime lift to the cup. Osmanthus flowers are native to China and have been cultivated for their pungent aroma and delicate flavor for centuries. 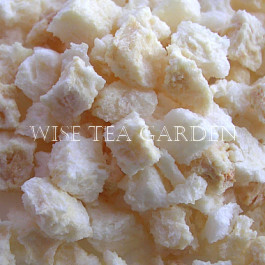 Ingredients: Luxury organic osmanthus petals. Infusion: Sunny yellow bright. Cup Characteristics: Sweet peachy citrus notes and subtle acidic tang make the taste buds beg for more. These freeze-dried peach pieces retain the satisfying sweetness of their fresh counterparts. Like the fresh version, they also make a wonderful addition to foods and drinks - tea in particular. Blend freeze dried peach with your teas or herbal teas to create unique flavor sensations. Ingredients: Peach pieces. Cup Characteristics: Ripe Bartlett pear flavor is smooth, mellow and delicious. Nose reminds of a stop at a roadside fruit stall. Making a fabulous iced tea with notes of honey and hints of pear couldn't be easier. 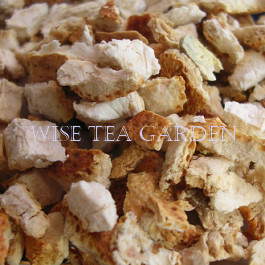 Simply add a handful of freeze dried pear pieces to a pot of honey flavored tea as it steeps. Strain over ice, add sugar to taste, a few pieces of pear as garnish and enjoy. Luxury Ingredients: Luxury freeze dried pear. Infusion: Clean pale cream. Cup Characteristics: Outstanding fresh from the vine raspberry character. Bold and juicy, a stunning addition to fruit blends. 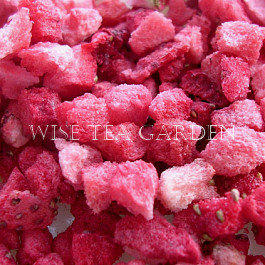 Luxury Ingredients: Luxury freeze dried raspberries. Infusion: Lightly pink. Cup Characteristics: The cup has light floral notes with a pleasant lingering finish. Often used to make a tea blend look exotic and romantic. 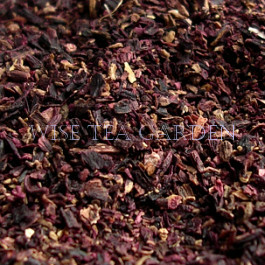 Luxury Ingredients: Luxury natural dried rose buds and petals. Infusion: Tending light pink with light rosy notes. Cup Characteristics: Very tasty herbal tea! Light notes of straw develop a sweet licorice-like profile. Light, refreshing. 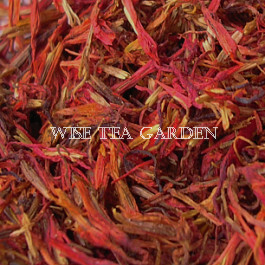 Safflower makes a colorful addition to custom blended teas and herbal teas. Safflower is known to be one of the world's oldest cultivated crops. In ancient Egypt, Safflowers were considered precious enough to be made into dyes for the ornamental gowns of the Pharaohs. Their petals were also tied into celebratory garlands, some of which were found in the tomb of Tutankhamen, and are thought to have been used for cooking as well. In ancient China, Safflowers held an important place in Chinese medicine. They were given to patients to ease sore joints, cleanse wounds and interestingly, treat the measles. Ingredients: Luxury Natural Dried Safflower. Infusion: Rich red or amber. Ingredients: Organic Spearmint. Infusion: Pungent, cool, fresh pale green. Cup Characteristics: Spice up your tea selection with this fabulous strawberry idea of Smoky Strawberry Love - a Loose tea blend: 2 parts Keemun, 1/4 part Lapsang Souchong, 1/4 part freeze dried strawberry, 1/4 part star anise. Thoroughly blend all ingredients in a drum or large bowl and place in jars or tins. (Adjust ingredients for larger quantities.) 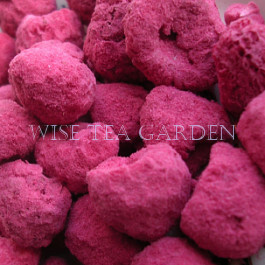 Luxury Ingredients: Luxury freeze dried strawberry. Infusion: Brilliant red notes. Cup Characteristics: Delicate and soft rose taste and character. Very pleasant and soothing. Dress up your own special tea or steep it on its own. Perfect for an afternoon with friends. 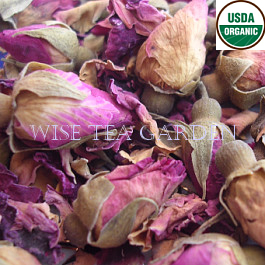 Luxury Ingredients: Luxury organic wild rose buds. Infusion: Light with pinkish hues.